Abby is a bright and chatty young lady. She recently turned seven and attends first grade at her local elementary school. Abby has been with NACD since she was almost three. By age four she was on age level for her auditory processing. She was reading high interest words and speaking in short sentences. She enjoyed talking with adults and other children. Her play was very age-appropriate. By age six she was doing math and reading with confidence. She was conversant. She was also attending public school and, of course, able to get on and off of the bus herself, go to class by herself, and perform other skills that you would expect from a six year old. Abby is in first grade this year. She reads above grade level and is great at math computation. Her reading comprehension is strong. She handles herself in an evaluation the way you would expect an older child to behave. She works independently and diligently. She converses easily on a number of topics, including her Hannah Montana shirt that was a Christmas present, she explains, from her grandparents. Her parents have done such a great job with her on program. The not-so-happy part of this story is the fact that Abby’s parents have had to battle to have the school district to allow Abby to ride on a regular school bus. 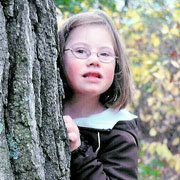 They continue to battle to keep Abby in regular education classes. In fact, Abby’s parents continue to need to educate Abby around that long public school day while they fight for a better education during the school day. So, Abby’s road is tough. This is not because Abby is not a good student. It is because Abby has Down Syndrome. It is so unfortunate that parents who are tremendously invested in their children and who have taken responsibility for educating their children still have such a battle with school districts. We see it all over the country. Abby’s mom is a nurse. She is fighting long and hard to get Abby to be treated fairly in her school. It’s obvious that this will be a long road. Some day I truly hope that every child will have the right to be educated.